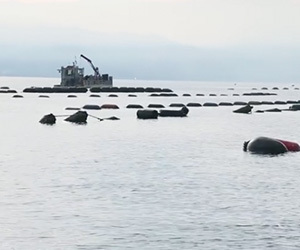 A proposed National Environmental Standard for Marine Aquaculture to make re-consenting of existing marine farms “consistent and efficient” was released on Wednesday. With approximately 64 per cent of the industry due for re-consenting over the next seven years, the new standard seeks to simplify the consenting process and cut costs. The new environmental standard targets an estimated 750 nationwide marine farms and is being touted as a means of reducing consenting costs for marine farmers and supporting more consistent regulation of the $500 million / year industry. Among the benefits of a national standard are consistent regulations for biosecurity, greater flexibility for changes of species and enabling most replacement consents to be processed by councils as non-notified restricted discretionary activities, said Environment Minister Dr Nick Smith. The proposed National Environmental Standard for Marine Aquaculture will also serve to increase certainty and industry confidence and reduce compliance costs, noted Primary Industries Minister, Nathan Guy. The public, industry and iwi are invited to review and provide feedback on the proposed new standard, which, if progressed, will come into effect in 2018.